What Areas of the Body Can Be Treated With VASERlipo? Dr. Lisa Precht is renowned throughout Washington state as one of the best liposuction and body contouring surgeons. Performing liposuction approximately 10 times per week, Dr. Precht has helped numerous patients achieve leaner, firmer, and more proportionate body contours. Thanks to her refined techniques, Dr. Precht has developed an exceptional reputation for delivering outstanding results, attracting countless liposuction patients every year. When it comes to weight loss, liposuction isn't a replacement for a healthy diet or regular exercise. However, liposuction is an effective solution for those seeking to remove stubborn deposits of fat that are not burned away through natural means. The liposuction procedure can provide patients with well-proportioned body contours when applied to several areas of the body. Ideal liposuction candidates include individuals who are in good health but are seeking to eliminate stubborn areas of fat that do not respond to diet and exercise. The ideal candidate for liposuction is a man or a woman in good physical health who struggles with excess fatty areas on the body that are resistant to diet and exercise. Patients with good skin elasticity tend to achieve the best results, while those with a significant amount of loose skin are often better treated with a procedure that combines liposuction with skin excision, such as an abdominoplasty (“tummy tuck”). For patients with a minimal amount of skin laxity, advanced VASERlipo has the added advantage of achieving the highest degree of skin tightening compared to other liposuction methods (including laser lipolysis), which further enhances the results of the procedure. With VASERlipo, Dr. Precht helps her patients achieve an improved body contour, which often leads to increased self-confidence. At Premier Cosmetic Surgery & Medispa, we are proud to offer VASERlipo — the latest, most technologically advanced method of liposuction and body contouring available today. Dr. Precht is one of the few surgeons in Seattle and Bellevue that has extensive experience with VASERlipo and offers this superior technique to her patients. If you have struggled with stubborn fat that does not respond to diet and exercise, VASERlipo is a minimally invasive procedure that can help you achieve the body you've always wanted without the risks, downtime, and difficult recovery of major surgery. As the most technologically advanced method of fat removal available today, VASERlipo produces superior results with minimal downtime. VASERlipo utilizes ultrasonic energy to treat the areas of fat, and the fat is subsequently removed with tiny tubes. The initial phase of the procedure involves the use of tumescent fluid, an anesthetic solution injected under the skin that produces a numbing effect and prevents bleeding. Thanks to its high level of safety, tumescent liposuction is the standard liposuction method performed today. Also, because the area injected with the anesthetic fluid becomes numb, there is no need for general anesthesia, eliminating many of the risks associated with major surgery. After the tumescent fluid is introduced, a tiny VASER probe that emits ultrasonic energy at its tip is inserted to dislodge the fat from the surrounding tissue, while leaving vital structures unharmed. Because of the powerful yet gentle energy emitted, the surgeon is able to remove more fat with VASERlipo than with any other liposuction technique. One of the main reasons that Dr. Precht, who has utilized virtually every liposuction machine available, favors VASERlipo is that she can get more fat out with this technique. Once the ultrasonic energy emitted from the VASER probe has dislodged the fat sufficiently, the fat is then removed via a tiny tube called a micro-cannula. The fat is then aspirated into canisters that the patient can view when the procedure is concluded. Step 1: Infiltration– Dr. Precht injects tumescent fluid into the fatty layer. Step 2: Ultrasound Deliver – The VASERlipo surgeon uses a special probe to deliver ultrasound energy into the fat cells, causing them to separate from each other and blend with the tumescent fluid. Step 3: Aspiration– Using a special suction micro-cannula, Dr. Precht easily removes the loosened fat cells. 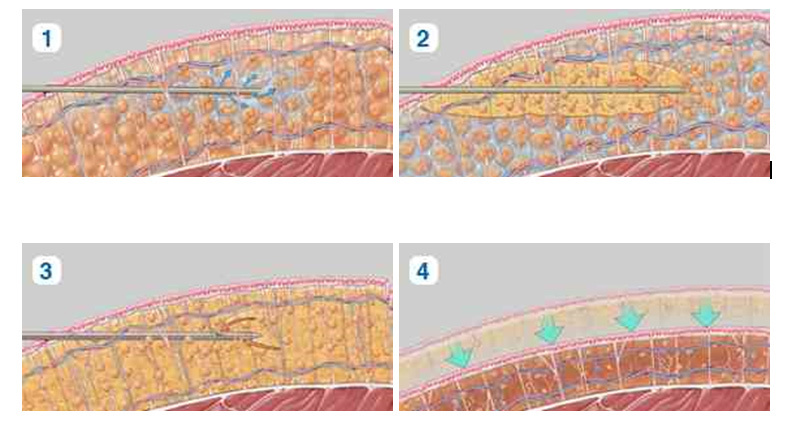 Step 4: Skin Retraction– As the body heals, the skin in the treatment area tightens, producing natural -looking results. What Happens Before My Lipo Procedure? At Premier Cosmetic Surgery & Medispa, we strive to deliver outstanding, beautiful, and natural results with the least downtime possible. Instead of using the sharp instruments and aggressive suctioning associated with traditional liposuction, Dr. Precht performs VASERlipo, a minimally invasive method of fat removal that produces superior results. Thanks to this less-invasive technique, our patients have much shorter recovery times and return to normal activities quickly. When you arrive at our office in downtown Seattle for your lipo treatment, you will meet your anesthetist who will be with you throughout the procedure monitoring you. Because general anesthesia is not needed, you will recover faster. Your anesthetist will give you IV medications that cause relaxation and sleepiness. This allows Dr. Precht to remove the maximum amount of fat from the treated areas, while ensuring a comfortable, pain-free procedure for you. Most patients report feeling like they took a short nap and the procedure was over. How Long Does VASERlipo take? Typical procedures last from 1 to 3 hours, depending on the number of areas being treated. After the procedure, you will rest in our peaceful spa room until your caregiver arrives to take you home. Your caregiver will need to stay with you for 24 hours at home. If you do not have a caregiver, we can provide you with information regarding affordable care-giving agencies in the area. Because the VASERlipo process is so gentle and precise, our patients have superior results and experience an easier and faster recovery than those who undergo other types of liposuction. In comparison to patients who have undergone other liposuction methods, VASERlipo patients have less bruising, swelling, and postoperative discomfort. The morning immediately following your procedure, you should be able to resume your light everyday activities. Most patients report that the discomfort they experience feels like they had a strenuous workout, and they can usually return to work after a few days. We provide you with a special garment to wear postoperatively that greatly reduces any swelling and provides added comfort as well. The majority of the swelling is gone within one week, and every week for the first month you will continue to shrink as the swelling continues to resolve. We take your first set of “after” photos 4-6 weeks after surgery, and most patients are amazed at the transformation! You are able to enjoy your new body soon after the procedure! Whether it is your abdomen, back, thighs, arms, or chin that bothers you, Dr. Lisa Precht can help you achieve the body that you have always wanted. During your consultation, Dr. Precht asks you about your areas of concern and listens to your body contouring goals. She then informs you about the available treatment options and helps you set realistic expectations for the outcome of surgery. Together, you will develop an individualized treatment plan that allows you to achieve the body you desire and enjoy your new life! To schedule a personal consultation with Dr. Precht, or to learn more about your liposuction options, please contact Premier Cosmetic Surgery by calling (206) 659-0505 or by using the Contact Us form on the right. Dr. Lisa Precht is proud to offer a number of sophisticated body contouring procedures. Over the years, she has earned a reputation as an outstanding tummy tuck, liposuction, and laser skin resurfacing specialist. In addition, she performs leading-edge combination treatments, such as mommy makeover and body lift.